sorry the sound is poor - it is a tiny camera and just used the inbuilt microphone to see what happened. It doesnt have port for an external microphone - it is just the fuji washable camera I bought for food pictures. 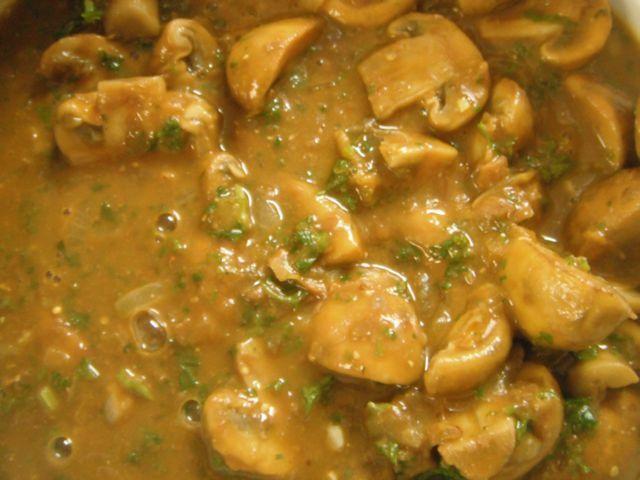 Those of you that can remember what it was like to be a vegetarian in the 1970's and 80's may view a recipe for mushroom strogonoff with a twinge of loathing. 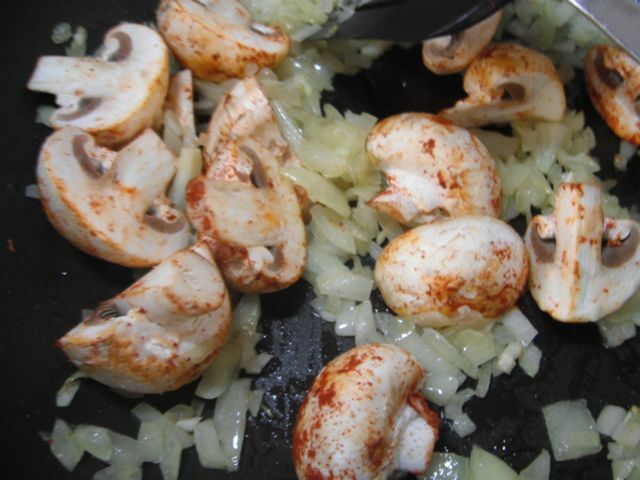 For a long time, after the sole option at restaurants was an omelet, or if it was really posh, a poached egg, the standard veggie option was mushroom strogonoff. I haven't eaten, let alone made, a mushroom stroganoff for at least a decade. However, in the store today mushrooms were cheap and I had pastry ready in the fridge so I thought a pie with mushrooms would be a good supper. I ran out of time doing other things so didn't get around to preparing the other ingredients for my pie. 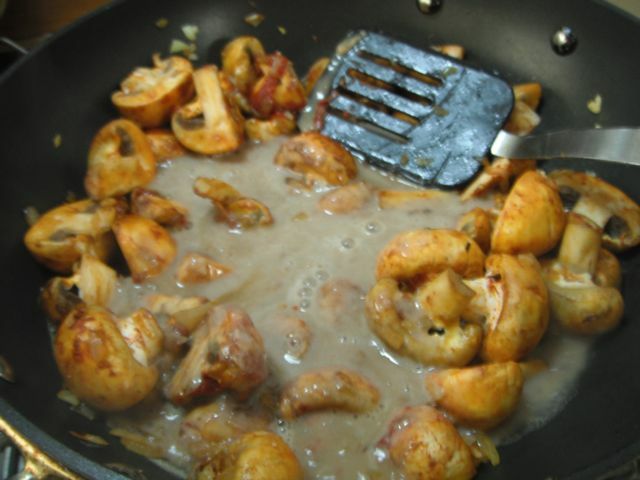 Mushrooms being sold off cheap because the store wants to get rid of them need using...stroganoff with baked potatoes seemed the ideal solution. I used a recipe from http://vegbox-recipes.co.uk/recipes/mushroom-recipe-2.php simply because it was the first one to lad - my Internet was being very slow and I kept changing URLs till I found one that came up before my patience vanished. It included wine and cream, and I didn't have any wine and, being lactose intolerant, didn't want to use the cream. I added half a can of borlotti beans to increase the protein of the dish and to act as the thickener. I blitzed them in a blender before adding them; they gave a thick creamy texture that satisfied even the diary lover taste-buds of my Tolerant Taster. Fry onion in oil until translucent. add other flavourings apart from parsley. Cook until thick and luscious looking. Stir in chopped parsley and serve. I served this with baked potatoes and fresh buffalo mozzarella for anyone that wanted it. Excellent flavour and really easy to make. I'll definitely add this to my regular repertoire of simple supper dishes. This isn't about food directly - but perhaps it is really. I read an article about some research into creating habits. (original abstract at http://www.ucl.ac.uk/hbrc/diet/lallyp.html). The study participants took on a new behaviour such as eating fruit with lunch or going for a run, and tried to do it at the same time every day to create an automatic cue for the behaviour. It took between 18 and 254 days for this new behaviour to become automatic, with more complex behaviours taking longer (eating a piece of fruit is easy, going for a run is harder). Average time to self-reported aromaticity was 66 days. So, if you do a new desired (or undesired) behaviour every day, or almost every day, within a couple of months you are likely to do it without thinking or making yourself have to do it. If you have new year's resolutions that you want to keep, look out for the long haul. Better still, start now, and when everyone else is just getting started you will be half way to the new you. Maybe this is about cooking after all. I started blogging about food a couple of months ago. I had some gaps when I was teaching, but now if I haven't done something I can write about each day I feel oddly bereft, and lurk at the computer. I've almost got the habit of blogging...now for some of those other things, like vacuuming...how can I make housework as simple and rewarding to do. I need the equivalent of reader statistics to make feel more motivated. After about twenty hours in the the oven with just the light on the peel was crisp and dry and utterly delicious. I put some in jars and the rest I chopped up fine for the mincemeat. The jar on the left has the larger pieces of grapefruit peel. Without the sulphites the colour will probably darken, particularly with exposure to light. I'll keep an eye on it and re-post any significant changes. It should still taste good even if it does go brown. 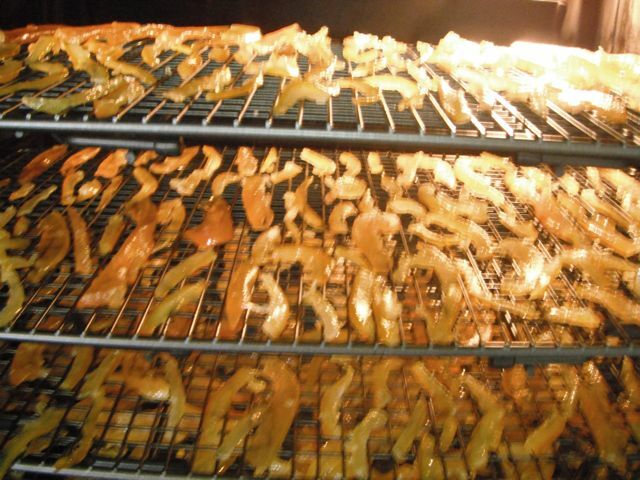 I like candied peel but find it usually contains sulphites. These don’t trouble me, but while I am making food for people who can’t eat gluten it seems sensible to avoid as many of the usual problem food components as possible. 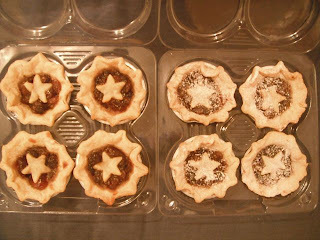 I am about to make a batch of mince pies for a local farm shop. 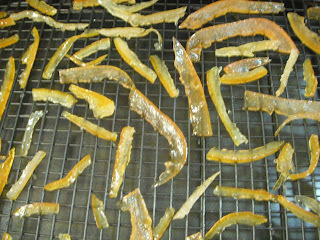 I could just use bought mincemeat, or make it without the peel, but the recipe for candied peel looked very easy though it needed quite a long time for all the stages. I started by buying three lemons, four oranges and a grapefruit. I don’t remember why that particular number, but I don’t think it matters as the recipes I looked at all called for different proportions of the citrus fruits. I scrubbed them, then slit the peel with a sharp knife and removed the peel. 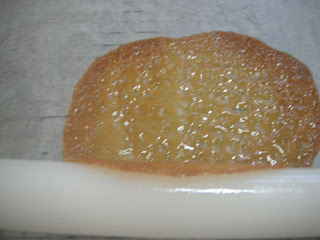 Some recipes say juice the fruit first, but then later on they say scrape the membrane from the softened peel, and that sounds too much of an effort. 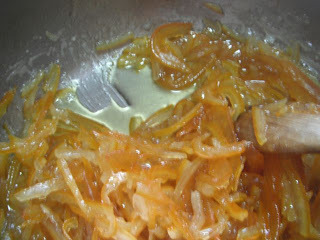 I slivered the peel then cooked it in water until soft. Just add enough water to cover the peel and top up as necessary. Stir occasionally to avoid sticking and burning. Some recipes suggest boiling then draining, reboiling in fresh water, draining, reboiling in order to cut the bitterness. I decided not to do this as I like bitter marmalade and I want the peel primarily as an ingredient in cooking. Actually, having finished the peel I don’t think I would want to reduce the lovely bitterness even if I was going to eat these plain or dipped in chocolate. 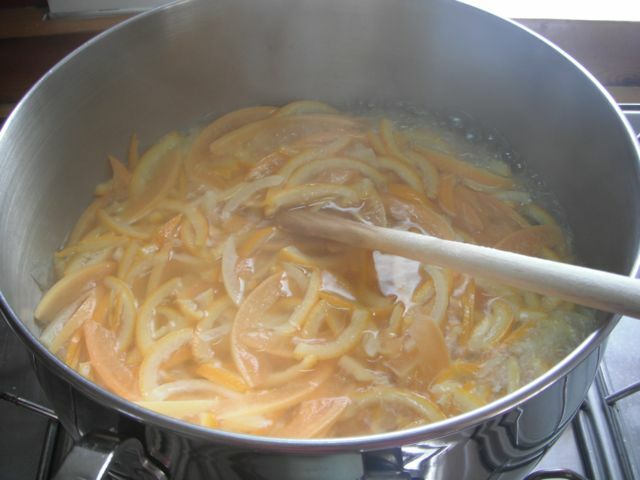 When making marmalade I have softened the peel in pressure cookers and in the microwave – use whatever method you find easiest – all you are doing is getting the peel to the point where you can squish it easily between your fingers. Drain the peel, reserving the liquid. I plan to make citrus Turkish delight with this liquid as it seems a shame to waste all that flavour. I’ll post information about that when I do it as well. I ended up with 650g of cooked peel (I forgot to weigh it before I started). I added the same amount of sugar to 300g of water, which gave enough syrup to just cover the fruit. Add the fruit and cook gently until almost all of the syrup is absorbed. 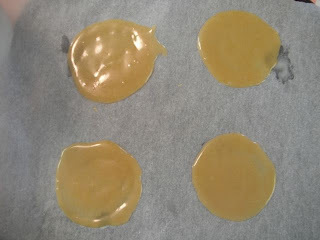 I added a bit more sugar, totalling 800g, as I thought the peel was too bitter, and the more sugar it has the better it should keep. Stir occasionally. Check every fifteen minutes or so to make sure it isn’t sticking or burning. This could take up to a couple of hours on a very low heat. 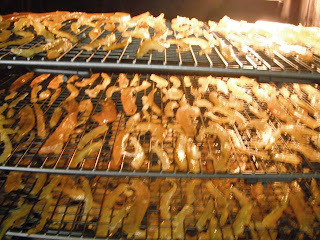 Spread the peel out on racks and leave to dry somewhere warm. I put these in my oven with just the light on, and every now and then put the oven on its lowest setting – it’s a fan oven, to drive out the moist air and add a little bit of extra warmth. Slow drying rather than cooking is what is being aimed for. In the summer I dried glace cherries on a stack of cooling racks covered in a tablecloth to allow air circulation and keep flies and dust off. That worked fine too. These should be dry enough to make the mincemeat tomorrow with some of the peel. The rest I will store in airtight containers until needed. I made these with a pack of ready mixed all-purpose gluten-free flour called Bob’s Red Mill. I normally mix my own flour for different recipes from Urid lentils, tapioca, polenta and almonds. 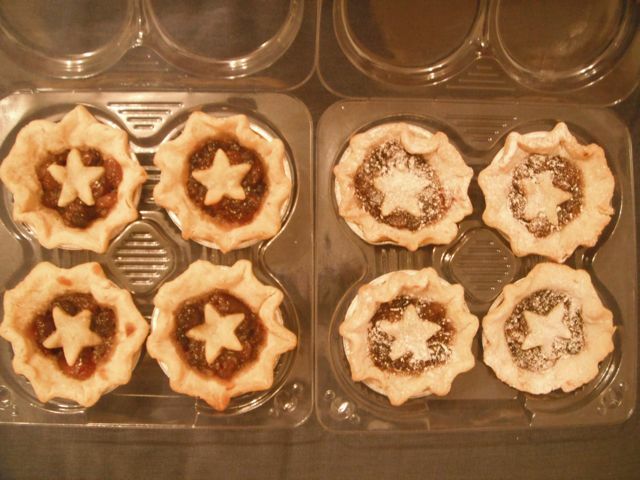 The recipe made ten deep-filled mince pies and six mini pies. 35 ml water – add slowly until you have the right amount. You might need more or less depending on the flour and the humidity of the air. 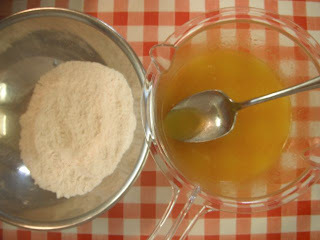 Whizz fat into flour in food processor or rub in by hand until it resemble breadcrumbs. 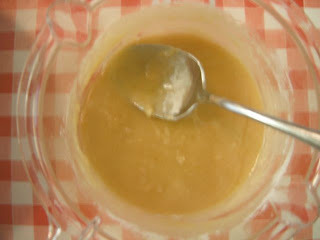 Add the sugar, whizz, then add the egg and whizz just until mixed. I tip out into a bowl and add the water by hand to be sure not to add too much, but you can just add the water in the machine and whizz until it just starts forming a dough. 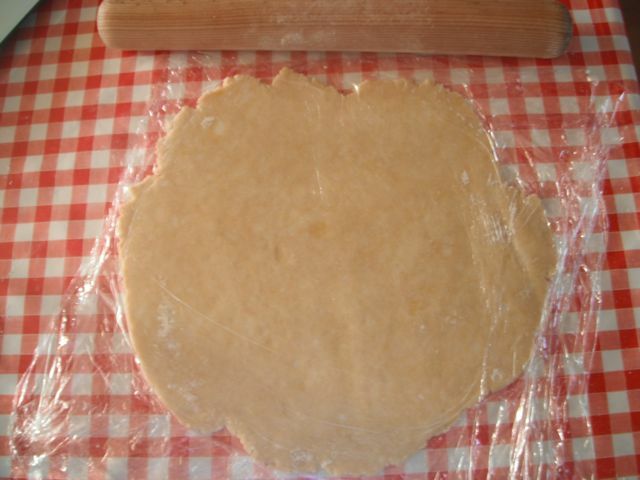 Roll out the pastry between two sheets of cling film / plastic wrap – this saves on mess and having to add flour. 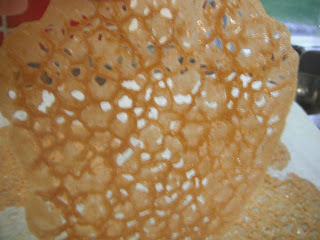 Cut into circles and place in tart tins or other tin of choice. Half fill with mincemeat. 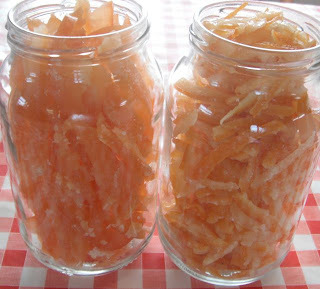 I used some from a jar for this but have bought citrus fruit to make candied peel this weekend so I can make some without sulphites. Bake until the pastry is just turning golden. Mine took twenty minutes at 170C in a fan oven. I sifted icing sugar over half of the mince pies. 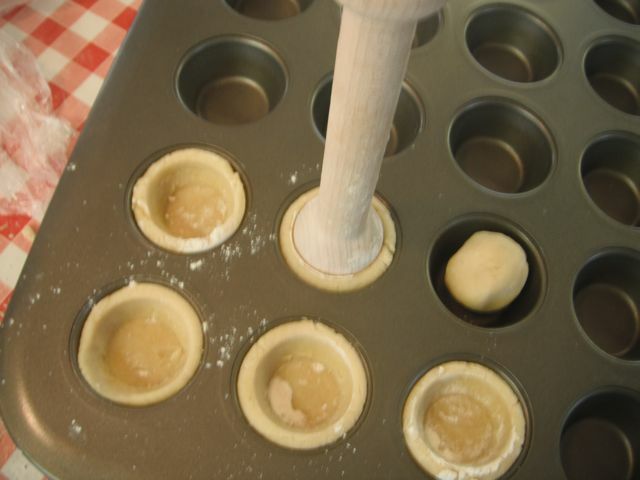 I used a mini muffin tin and what I call a stomper (mini-tart shaper: The Pampered Chef http://bit.ly/g23sN5). Take a ball of dough (about 18g), place in bottom of tin, dust stomper with flour, press into dough twisting slightly. You will get a neat little pastry case with remarkably little effort. 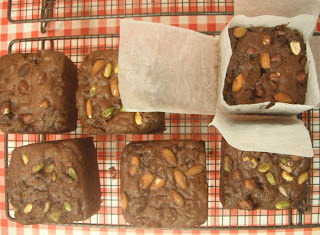 On November 19th I posted a trial of the BBC Good Food chocolate Christmas cake, using three different gluten-free flours and dairy/non-dairy fat ( http://bit.ly/9TC6E3). 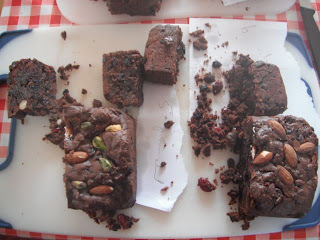 We just retested the cakes, on Nov 25th, as they have had some time to mature. The flavours have blended with the extra time and it isn't so much of a shock to have chocolate with fruit lumps. The textures of the cakes are closer together. We still liked the one made with my own blend of flour and the butter best. The Bob's Red Mill flour, from lavidafood.com, made with Pure, was good, so if you want a vegan gluten free cake made from standard flour rather than mixing your own I suggest this is a good choice. Doves Farm was still producing a fine pasty texture - I think it is the rice in the flour mix. I tried writing text and taking a photo in other apps on this phone. I found blogger and even got into the correct part, but don't seem to be able to import either text or photos. Posting this anyways as part of my learning and will amend when I get to my computer. I am about to eat at a Wetherspoon's cafe in Worcester. We read that they provided gluten free meals, and even listed everything clearly on their menu. I am a little surprised their roasted veg isn't gf, but even more surprised that the only fruit crumble they serve is gf, and isn't more expensive than the other deserts. They also give information about how to eat vegan, vegetarian and low fat meals. 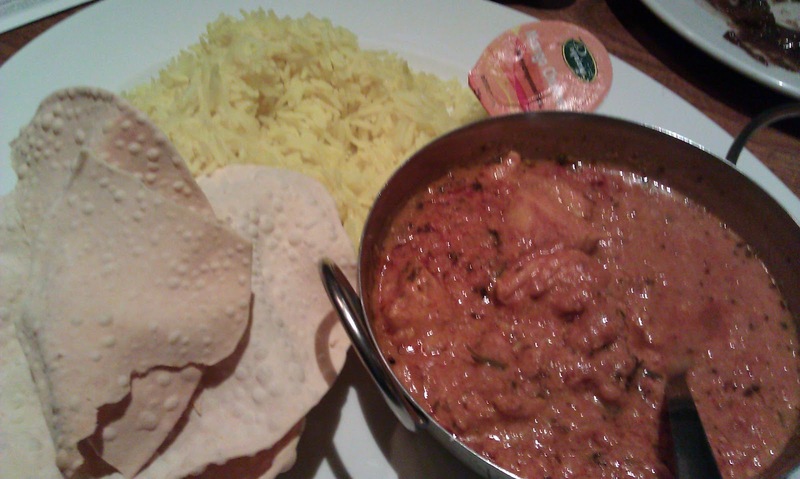 I ordered the curry, saying I needed people to not even touch my plate if they had been touching bread. Rather than the usual blank look the waiter said he would make a note. I asked about the poppadoms (you get offered more as a substitute for the nan), saying last time I ate these in a restaurant it turned out they had wheat in, and I was ill for four days. He went and checked, coming back swiftly to say the packet said gluten free. I did wonder if they would fry them in general purpose oil but they were grilled. The meal was fine, your standard neutered English curry but with enough spice to be clearly a curry rather than a stew. Tolerant Taster had steak pie and chips and beer, which he said was very good. The staff were courteous, the meal prompt, and two full meals with a drink and one desert was only about fifteen pounds. The crumble had an odd chewy, granular structure. 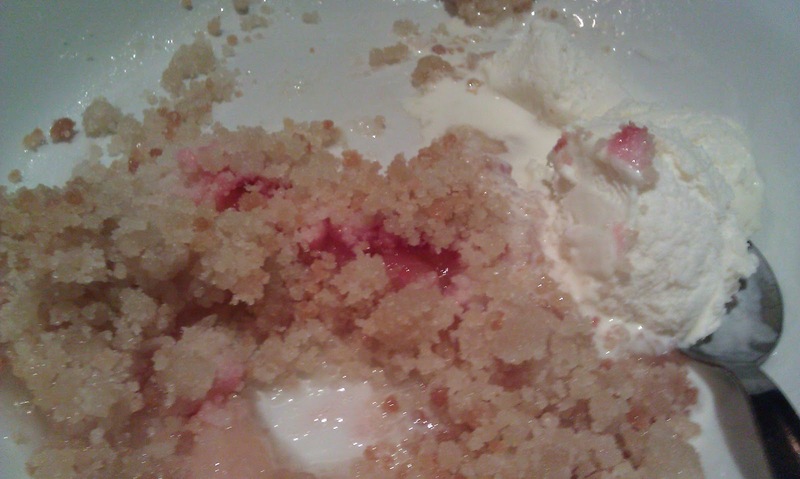 It was a substantial dessert, but neither the texture nor the flavour were particularly enticing. Looks the part and crumble is certainly the right word in that the topping has no coherence at all. It simple falls apart as your spoon hits it. It crumbles to a sort of granular structure with a particle size between 2 & 8mm. 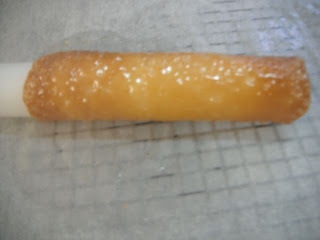 Some particles are harder, slightly chewy, suggesting that they got a bit more sugar that glued them together. A little too sweet, so that there is little contrast between the apple underneath and the topping. I now just have to wait and see if it is actually gluten free. If is is it will make managing to feed myself when out in strange cities a lot easier. I would say full marks for making an effort. The food reminded me of service station food from back in the days when I ate it…certainly a great improvement on having to go hungry or just eat the plain crisps. Today is my birthday...I am fifty. 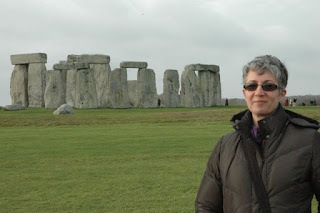 It seemed appropriate to do something special so have finally been to see Stonehenge. In the National Trust guide it said 'eat at award winning vegetarian and gluten-free restaurant at nearby Avebury’, or words to that effect. Minor problem that the two are forty five minutes drive apart, but Avebury has an astonishing number of giant rocks scattered over a huge area. 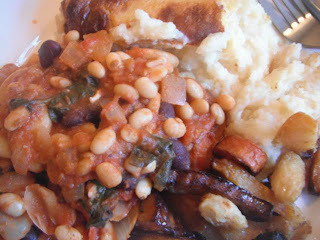 The restaurant is really a small cafe, and there wasn't much choice, but the three bean stew was delicious and spicy, and was served with gratin potatoes and roast winter veg. Portion sizes were based on the assumption we had been tramping over fields for hours rather than strolling in from the carpark. I did find a grubby spoon in the cutlery tray so hope I don't get ill from cross-contamination. Only time will tell. This would have been my first posting from a cafe, on my new smart phone - testing the system. However, there was no signal so I couldn’t access blogger, so wrote this in Word, and then realized I had taken the photograph with my other camera. Never mind, learned several new tricks. Pleased to report that, whilst getting a bit of colic from the dairy, no evidence of any gluten contamination. Since I am extremely sensitive I declare this cafe safe to eat in! I looked at several recipes. They are all basically flour, butter, sugar, syrup and flavourings. 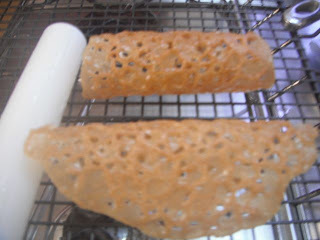 I worked with one from Eleanor Smallwood on http://uktv.co.uk/food/recipe/aid/594837. I did two batches, one with Doves Farm gluten free mix and one with Bob’s Red Mill all-purpose flour. I did a half recipe of each. This produced fourteen brandy snaps. Melt the sugar, syrup and butter together. I did this in the microwave. 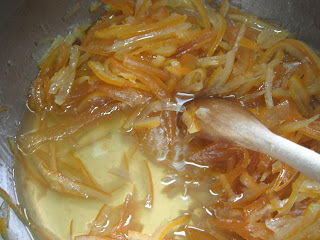 Mix in the flour mixture and add the brandy and lemon zest. 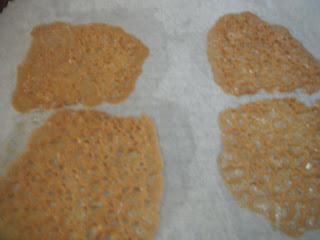 Spread onto baking parchment on a baking sheet. Dollop about half a tablespoon on and spread out a bit. Leave lots of room as they will double in size. Bake in a preheated oven about 180C for about six minutes. Keep an eye on them – you want a warm caramel colour. You can always put them back in for a while if they are too pale. Take out and let cool for a moment. You want the mixture to be just able to be lifted without being hard as you are going to roll each biscuit around a lightly greased rolling pin – as in the recipe, or, as I found easier, around a greased mini-rolling pin normally used for sugar craft. If the biscuits have merged just push a gap between them while the batter is still very soft. 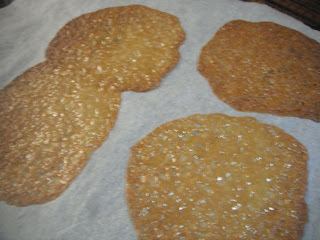 I found it best to slide the baking parchment onto a cooling rack until the biscuits just started to firm up, and then slide the paper back onto the hot tin to stop them getting too hard before I could roll them. Roll each one around your chosen implement and set on a cooling rack to continue to firm up. Store in an airtight container when cold. I need to run tests to see how long they stay crisp – I’ll post on that later. 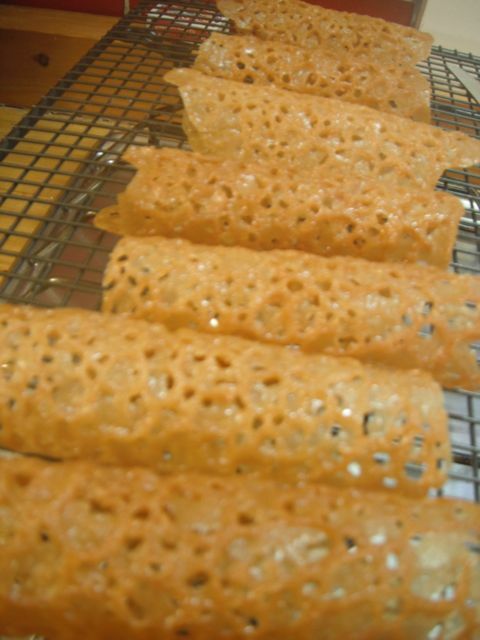 If your brandy snaps get too firm to work with just place them back into the oven on the baking parchment to soften for about ten seconds. I left some to get too hard to work, put them back into the oven, and watched them slump back onto the sheet neatly. I could then continue the rolling easily. If you want brandy baskets just oil an upturned jar or similar, drape the cooked biscuit over the jar and ease into shape. Set aside to cool completely before storing. Both Doves Farm and Bob’s Red Mill flours worked fine. The Dove’s Farm produced a lacier finish, and I got eight from the batter rather than six from the Bob’s Red Mill. It may be that the DF flour gives less cohesion (which I would expect) so you get a thinner batter, but I’d have to run the tests again to be sure it wasn’t just something I did. 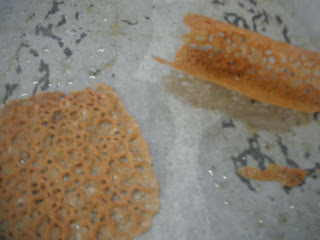 Both flours produced an acceptable brandy snap. However, on first tasting I prefer the one made with Dove’s Farm flour. It is lighter and more brittle, and produces an easy crisp eating process which would go well with a filling of cream or icecream. The Bob’s Red Mill flour has a more substantial, chewy caramel feel, and would be great eaten on its own or with a dipping chocolate sauce. My resident Tolerant Taster is out at the moment so I can only offer my views. I’ll post his opinions later with the aging tests on the brandy snaps. I highly recommend you have a go. This is an easy recipe that allows a lot of room for not being too confident as you can put things back in the oven to re-soften if you make a mess. This will allow for some pretty dramatic deserts, and if they keep ok, will mean the time-consuming part can be done ahead of time. I’ll freeze some to see how they cope as well as putting them in plastic tubs. These have stayed crisp in a plastic tub for a couple of weeks....but have now all been eaten. They were very good and indistinguishable from brandysnaps made with wheat flour. I shall certainly add them to my usual repetoire. Given that they keep ok I will also make brandysnap baskets for deserts for dinnerparties, as they are an easy way of adding some flair to a smilple desert of fruit and icecream. Just press them over an oiled mug to make a bowl shape. As a household we generally only eat bagels as our bread, because the gluten free dough works best as bagels. I used to make traditional sour-dough bread regularly, and at one stage had three different sour-dough cultures. One was the San Francisco culture, which I used most often, and the other two were Italian. One of these produced a cheese flavoured bread without adding any dairy products at all. However, as I gave up gluten Feb 2008 I worked to find a recipe that gave some of the pleasure of a proper sourdough bread. I wasn't too bothered about feeding myself because just feeling so much better was reward enough for me. To keep the house as gluten free as possible I needed to find a bread dough that would work with marmalade and cheese and be good enough for pizzas so that I wouldn't be tempted to cook with ordinary flour for Rod, who has enough to put up with being reminded constantly to keep gluten out of my way and doesn't need culinary deprivation on top of emotional abuse. My bagel recipe is reliable and I now make it regularly. I was shocked yesterday to realise that, after a lunch of bagels and salad, that we were a bagel-free household. The focus on baking zillions of cakes for Sara's wedding had distracted me from normal cooking. I started the dough yesterday and shaped, boiled and baked this morning. 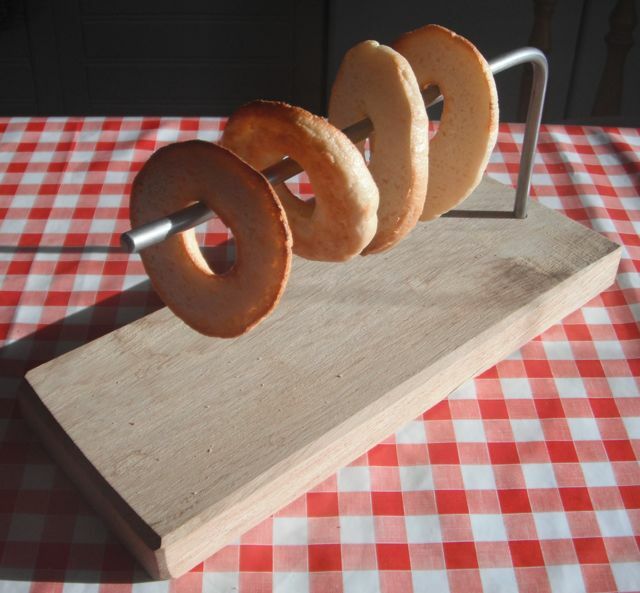 As we had fresh bagels for lunch, and Rod slid his lightly toasted bagel onto his bagel cooler, I thought this nifty little device needed a write up of its own. I bake bagels with urid lentil and tapioca flours. They take longer than wheat bread to toast and a lot longer to cool down - there's a proper term for this but it escapes me just at the moment. Rod used to slip the cut and toasted bagels into the freezer to speed this up. Now he slides the bagel onto the cooler he made from a piece of hardwood and a bent bit of metal. It holds the bagels perfectly while they are cooling and it looks beautiful as well. I have never seen such a device elsewhere, the closest being the pole that the Scandinavians cool their crispbreads on. Easy to make I expect if you know how to make a hole in a bit of wood and bend a bit of metal. Harder to make it look elegant I suspect. Anyone keen on blogging about food is likely to want to take photographs. I know people who won’t use a cookbook, or cook recipes within a cookbook, if there isn’t a picture to show them what they are aiming at. I’ve been trying to take pictures of each stage of my foods in case anyone wants to follow the process themselves. I know it is very hard to take good pictures of food, but at least they can be informative if not mesmerizingly enticing. I have been using a Nikon D70, a great camera if you want to be able to photograph just about anything and in particular if you have fast moving grandchildren whose darting and swinging and dancing you want to capture. It is less good for close up shots in a kitchen, not because it wont focus or give great pictures, but because it is large, heavy and very expensive. It is also, unsurprisingly, not washable. Getting flour all over any available surface is a normal concomitant of almost all my kitchen activities. We were in Jessop’s the other day buying a new data card for the Nikon. I ambled along the camera display and spotted a dinky little blue camera that was washable, freezeable and shock-proof. It took close ups and video; I have been considering adding video clips to the blog as some things, like cooking the bagels, have stages that are slightly hard to believe if you haven’t seen them for yourself. While we were looking at the camera the assistant approached and slipped a new price into the display label. It had dropped £10 just while we were admiring it. We went off to do other things – I don’t remember what, but it was two days before my step-daughter’s wedding so it was probably tights and lipstick shopping. Very mundane, anyways. Before we left town we decided it would make the perfect wedding present for a couple just about to go on a safari and beach honeymoon. We went back to the store and bought two. It is my fiftieth birthday next week so I had a slightly early present – I never was bothered about the whole notion of getting things on the right day. So, I now use a Fujifilm XP water/shock/dust/freeze proof camera for all these write-ups. Our camera took great movies of the fireworks at the wedding, capturing the response of the crowds as well as the lights in the sky. It is slow for normal photographs, and wouldn’t really do for quick moving people, but the quality of the video is surprisingly high and possibly one could extract stills from that. Back to the kitchen. It fits in my apron pocket. I can switch it on and take photos without having to stop each time to wash my hands. I can switch off the flash easily and keep the correct tones in the food, which is useful when showing a bowl full of different ingredients. The data-card doesn’t seem to work when plugged straight into the card reader on my (several years old) printer, but the wire works fine and so does the USB multi-data card reader. I’ve been very happy with the quality of the shots so far, and find it a lot easier to use and less worrying a part of my floury cooking. 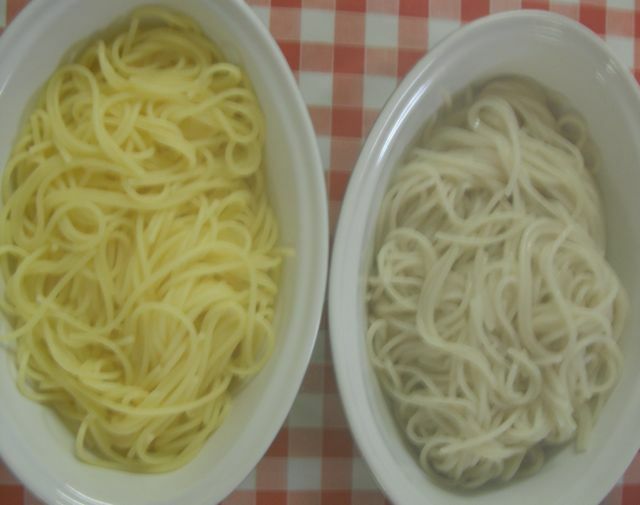 I made two types of spaghetti to test this evening. I had intended to test three, but the Tesco organic wasn’t available in the shop when I went yesterday (unless I am imagining I have had their spaghetti? I usually buy their penne etc as it works very well). 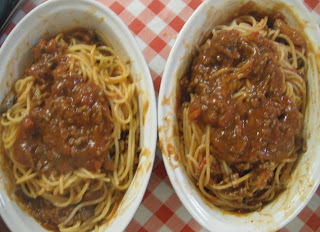 I served both with a Bolognese sauce made with a tub of mince and mushrooms from the freezer and a jar of Seeds of Change tomato and chilli sauce. After baking so many fruit cakes yesterday I didn’t feel like cooking, and I am still struggling to tidy up after the focus on the step-daughter’s wedding last week. My sister, Joy, had complained that her gf spaghetti tended to stick even if she used a bit of oil when cooking, so, of course, I immediately had to set out to find her a suitable product. The corn pasta is bright yellow. The quinoa and rice psta is a pale brown. The dishes are a bit splattered - I mixed the pasta in a dish that was a bit too small for elegance. I know some of you out there can't eat quinoa, and some can't eat corn, but if you have a choice the comparison might be useful. I followed the instructions for cooking on both packets. The quinoa one said cook for thirteen minutes, the other one three minutes stirring occasionally in an open pan then five minutes with lid on (though it did say turn off the heat and I forgot to). Both were mixed with same sauce and served from the same type of bowl. Considering he usually doesn’t like to eat quinoa products in any form I thought this was remarkably positive. I thought that the corn spaghetti was considerably more bouncy. 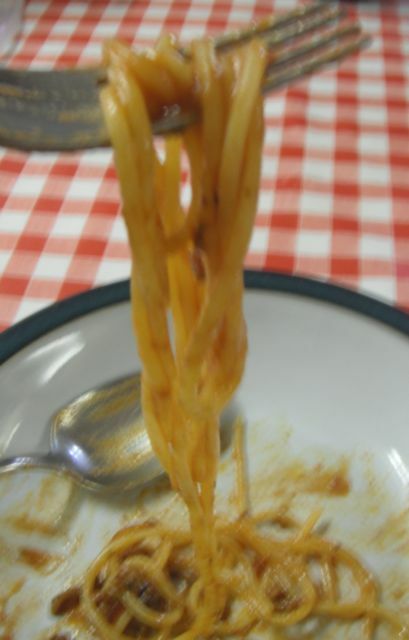 It didn’t seem to change in texture as the meal progressed, and I could still hold strands from high without any breakage fifteen minutes after the sauce went on. I liked the flavour of both though they were a little different. The quinoa one definitely had an extra flavour level that seemed less usual for a Bolognese type dish, but it was very mild and you would probably have to be looking for it to notice. I liked both, but the quinoa one was definitely getting mushier as the meal went on. I will check them later this evening both cold and reheated and give another view. Preliminary test suggests that the corn retains its shape better and doesn’t stick together at all. This was the complaint I had had about other gf pasta. I checked a few hours later. The corn pasta was still firm and soft and could be lifted as full strands. It stayed this way after re-heating in the microwave. 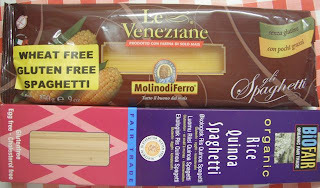 The quinoa pasta got steadily mushier, and could only be lifted as short strands particularly after re-heating. The flavour of both was still fine after four hours. The cakes were coded by putting different types of nuts on top. For the testing we didn’t know that flour or fat were used in each. We considered taste and texture. We took them in random order. In general I think this should have more cake and less fruit. If making again I would increase the eggs, and perhaps chops half of the fruit to give more cohesion. We both like number three best. I had a nerve-wracking moment when I couldn’t find my code list. It was on the book rest I had used to hold the magazine! Turns out we both like the one made with my own flour mix, which was about one third tapioca and two-thirds urid. We preferred the butter version. I think Pure margarine, as a soft margarine, isn’t really suitable for this type of cake. I have been recommended another type of Kosher dairy-free margarine for cooking but it is difficult to buy unless you get it mail-order from Ocado. I did buy some Cookeen yesterday, and will be running comparisons with that. In general we like the cake flavour and texture made with my flour best, then the Bob's Red Mill flour, then the Doves Farm flour. In general I haven’t been impressed with the Doves Farm mix for anything other than batter recipes, such as pancakes and choux. It does also work in the cupcakes I used for the wedding tower, but there are also a lot of almonds and yogurt in that cake recipe. The really surprising outcome is how much the type of flour affects how much you can taste the chocolate. In some cakes it had too much chocolate flavour and in others you might not have known there was chocolate in it at all. This is despite all the recipes being made with identical ingredients, method and cooking apart from the fats and flours on test. The nuts were only on top so that the cakes could be told apart. They were not taken into consideration when testing the cake.